Why Does Everyone Tell me to Bend my Knees? This is likely the biggest piece of advice given to hockey players when it comes to skating, however many players still have trouble getting enough knee bend. In fact I have spoken with some trainers who skate pro players and they say the first drills they do during the off-season involves getting lower to break bad habits the pro’s have developed over the season. So why is knee bend so important? I Don’t Like to Read, Can you do a Video? How do I know if I’m in a Good Hockey Stance? I am unable to get this low. Even when thinking about it, I can’t. Can you give me some flexibility or some other exercises to help me get lower? Thanks. Doesn’t quite feel right to be ‘advertising’ here, but I actually just published a video demonstrating an off-ice technique that should help you develop and become more comfortable with a deeper knee bend. Very cool video, definitely thought provoking. I’ve actually been doing some similar exercises lately. I’m developing a new stickhandling course that uses more game-like drills and will also incorporate game-like foot work. Using the legs and getting lower is part of it. There are a number of drills that will help, they will encourage deeper knee bend. Your best bet is to take some power skating classes. 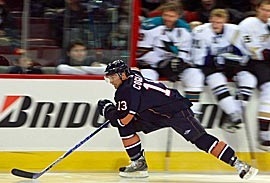 If you can get this low off the ice (squats) then you should be able to do it on the ice with enough practice.